This is 40 Movie Review: Super Funny because it’s all just so true! If you enjoyed the quick wit and hysterics in Knocked Up, you’ll easily find yourself enjoying the “oh that’s so true” funny moments in This is 40 that comes out in theaters this Friday, on December 21st. A must see go-to date night flick or movie to see with the girls over the upcoming holidays. I caught a preview of this in LA at the press junket last week – interviews to follow so stay tuned for the inside scoop! 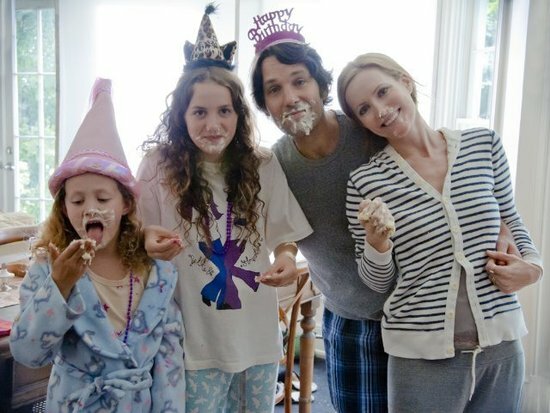 Now I’m not a laugh-out-loud sort of movie person, so I was surprised to catch myself laughing during scenes of Leslie Mann (Debbie) and Paul Rudd (Pete) facing everyday situations with their two daughters (Maude and Iris Apatow). What I enjoyed the most out of this movie is that writer/director Judd Apatow casted his own wife (Mann), his close friend (Rudd), and his daughters (Maude and Iris) to portray a family with normal issues like checking their daughter’s Twitter account for drama and checking themselves for hemorrhoids to capture those awkward moments that we all can relate to…for better or worse…But thanks to family, we are stronger for them. After watching the movie, everyone watching with me had their own favorite scenes. From the “shut-up” scene between Mann and her daughters to Rudd’s temper tantrum while he’s in the bathroom. It’s just all so true! But I have to say that I start laughing any time Melissa McCarthy is in a scene. No surprise, as her character is over-the-top ridiculous. So sit back and enjoy. At the beginning of the movie, I was calculating in my mind exactly how many blessed years I still have to enjoy before rolling myself over the big 40 hill. Thankfully, by the end of the movie, I found that the good stuff is still ahead for me! Check out the trailer for a couple sneak peek laughs before the movie comes out!